With respect to the red blood cell component of the blood, what can be determined by chemical analysis of 1 milliliter of serum? Not a big size to look at but the information associated with it can be lifesaving! 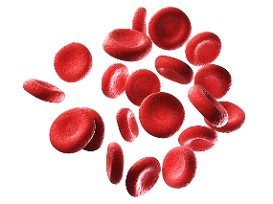 Red blood cells [RBC] function by carrying oxygen to the cells in your body, as well as taking away carbon dioxide from cells back to the lungs, where it is expired from the body. Red blood cells contain hemoglobin which has a mighty important job. In males the normal range of RBC numbers is an incredible 4.2-4.9*10(6)/mm3, while in females the range is females: 4.0-4.5*10(6)/mm3. To enable maximum amounts of hemoglobin to be utilized, the RBC is shaped in a biconcave disc which affords exposure to more surface area. The RBC changes its shape when it passes through smaller capillaries. When Dr Robert C Slater DC orders a complete blood cell count, criteria analysis of the RBC component of the serum plasma is determined to answer the following questions: 1-why are you feeling dizzy and light head after minor exertion? 2- why do my legs shake at night, 3- why do I get headaches and fatigued so easily? Call 651-699-3366 to get certain answers to these soul-searching questions!! Critical red blood cell analysis means getting three fundamental bits of information to unlock information to resolve the above noted issues. 1-What critical proportion per reference volume of blood, expressed as a percentage of that volume do whole red blood cells make up? The answer to this question is called Hematocrit. A Hematocrit of 38% means there are 38 milliliters of red blood cells per 100 milliliters of whole blood. Fatigue is a very common symptom of a low hematocrit [<37 in women/<40 in men] anemia. In fact, it’s often one of the very first signs of a health problem with people experience an unexplained loss of energy and booking an appointment with Dr Slater at healing Hands Wellness center for that very reason. 2- In grams per deciliter, how much hemoglobin, a protein in RBCs that carries oxygen to all cells of the body? Decreased hemoglobin [<13.5 in women/<14 in men] along with decreased percentages of RBCs in the blood often go hand in hand. When this deadly duo is present the health of the heart and muscles are immediately affected. If you are ‘out of breath’, feeling weak, develop lightheadedness and or headaches when performing daily activity of living, such as climbing stairs or walking a short distance this is probably due to lack of oxygen rich blood. 3- What happens when the hematocrit is multiplied by 10 and then divided by the estimated number of RBCs? The result of this analysis determines what is the mean Corpuscular [red blood cell as a corpuscle] volume. It makes sense that when red blood cells are smaller or larger than normal, a cause much be established to assist you in overcoming associated dizziness, loss of concentration and insomnia. Lifestyle modifications to reduce risk of anemia: insufficient number of red blood cells, low hemoglobin levels and irregular cell volume. Common sense dietary guidelines: chew food 20-30 times per bite, eliminate all artificial sugars, raw foods are best or as close to whole foods as possible, do not eat between meals, eat only when hungry, avoid refined starches, each small frequent meal instead of overeating at three major meals a day, drink 6-10 glasses of pure water daily [half one’s body weight in ounces] and avoid hydrogenated fats, preservatives, artificial colors in foods, refined carbohydrates and processed dairy products. Increase frequency and duration of aerobic exercise to overcome the negative impact of a sedentary lifestyle. Aerobic exercises (cardio) activity strengthens the lungs and heart and improves the body's ability to use oxygen. It can improve your heart rate and reduce blood pressure as well as improving breathing and digestion. your breathing. Good examples of aerobic activity are swimming, walking, jogging, bicycling, and running for 30 minutes at 3 times a week.